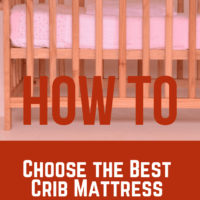 A good crib mattress is just as important as a good crib for your new arrival. Unfortunately, the ones that come free with cribs often leave a lot to be desired. There are few times when you physically leave your newborn out of sight. 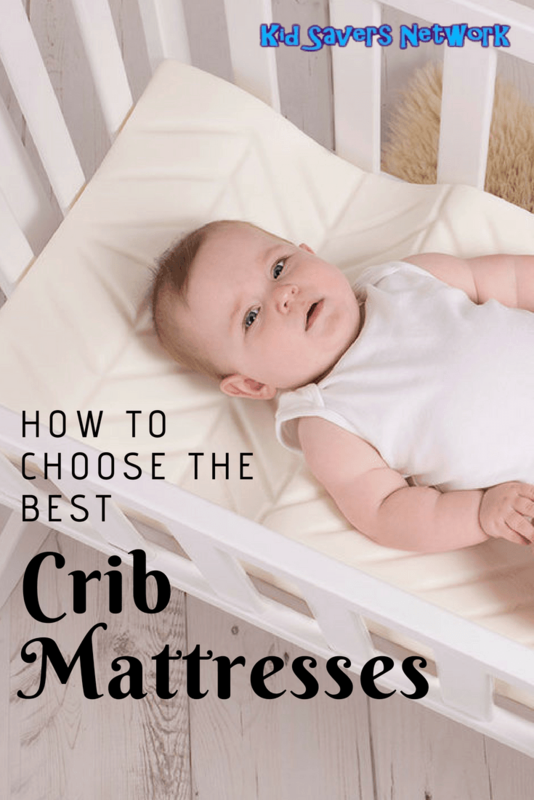 For this reason alone, choosing a crib mattress that’s safe, comfortable and healthy is quite possibly the most important thing you’ll do as a new parent. There are many different types available on the market. From foam interiors, fully sprung mattresses and an increasing trend for organic mattresses. 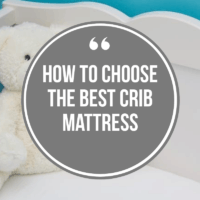 If you’re buying a crib mattress, you need to make sure it’s the right size! To do this, you need to know the size of your crib. 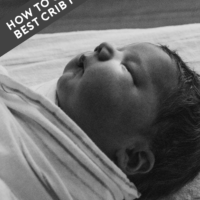 Fortunately, most baby cribs are “Standard Size”, and this is 51 5/8″ by 27 1/4″ by 6″ (max). The federal government regulates mattress sizes for a full-size crib. Usually, I’m against government control, but it’s reassuring as the standards are there for our little one’s safety. The good news is that most convertible cribs (“4 in 1” / “7 in 1” etc, etc) also use the standard size – 51 5/8″ by 27 1/4″ by 6″. The bad news is that many convertibles don’t come with an included mattress. Some do and you should watch out for the “Dual Core” mattresses as they’ll last longer (see below). Mini cribs are a popular choice with many parents to save space (and they’re cheaper!). Usually, they are 38″ long by 24″ wide. 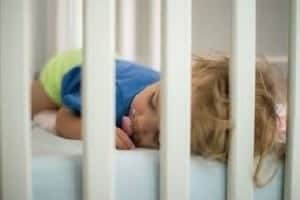 There are exceptions and it’s always worth reading the reviews around the mattress before buying a mini crib. You might find that the free mattress is not that good and then be stuck trying to find a substitute. Hypoallergenic mattresses have become increasingly popular. Parents love how they help prevent allergies and are safer for baby’s developing immune system . If you’re thinking towards keeping your mattress for the longer term, the new “Dual Core” designs are great. These kinds have one firmer side for an infant and another slightly softer side for a toddler. They are designed to meet the needs of a growing child, and are perfect for cribs that convert into toddler beds. It’s also nice to know if you’re paying out several hundred dollars that you can use it well into the future. All of the mattresses we reviewed also displayed amazing quality construction. 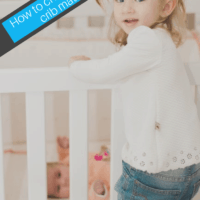 This is really vital if you’re considering handing down a crib to your second or third child. As with many important purchases, all mattresses have a trade-off in terms of price, quality, materials or features. However, the market is quite large. There’s more than enough choice to discover the best crib mattress that fits your particular wants and needs. We also tried to select products that can also be used in convertible cribs / toddler beds for even more use. We specifically mention when a mattress has gained certification under both the CentiPUR or Greenguard standards. As parents ourselves, we understand how important keeping your child safe from harmful gases and toxic materials is. We all want to find the safest crib mattress possible for our new arrival. 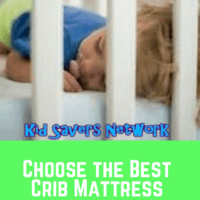 We have selected 5 of the best crib mattresses for review in 2019. This crib mattress is quite a modern addition to the baby crib niche. Moonlight Slumber are a relatively new company, having started back in 2004, yet they have created quite the following among parents by offering really top quality products. The Little Dreamer comes in slightly cheaper than their other ranges, yet still offers the same levels of safety, comfort, and durability that parents have come to expect. Perhaps one of the best things about it is it’s designed and made right here in the U.S.A! It is certified by CentiPUR-US, meaning it’s been manufactured without any harmful chemicals, toxic flame retardants or other nasties that can commonly be found in modern day furniture. You need to be aware it’s “Hard Foam”, but don’t let that put you off as it’s medical grade foam. It’s also “Dual Core” meaning the extra firm side is for infants and the firm side is for toddlers. The Little Dreamer is also side-stitched which is a neat little feature. This means if you drop or spill anything on the waterproof cover there’s no annoying little gaps or crevices like on mattresses with “standard stitching”. Who’s this for? Parents who are on a budget but feel reassured with a crib mattress made in the U.S.A. 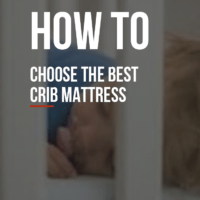 If you’re on the hunt for a baby crib mattress that’s good quality, safe and is also 100% hypoallergenic, then the Newton Crib Mattress is for you. 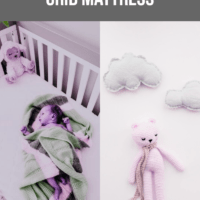 This product has been designed using 100% recycled and fully breathable materials, keeping your baby comfortable and regulating temperature during the night. It’s so good in-fact that they recommend parents don’t use an additional top sheet. Newton Rest believes this will dampen the breathable characteristics of the mattress.Instead, they have made the cover sheet washable. Sounds odd, but it must work, because hundreds of parents report their children sleeping through the night on this mattress. The first thing many report doing (and to be honest I’d be the same) is to smother themselves with the mattress and discover you can breathe right through it! (The same concept used in high-end baby pillows). So, if you’re looking for a mattress that’s breathable, made from recycled materials or that doesn’t feature any foam, latex or chemical glue, then the Newton crib mattress is for you. Who’s This For? Parents looking for a 100 % breathable, hypoallergenic mattress. SAFETY: Our innovative Breathe-Thru Technology allows air to flow freely and is independently proven to reduce the risk of suffocation and CO2 rebreathing, even when your baby starts to roll over at night. COMFORT: Temperature regulating to prevent overheating, eliminate sweaty backs and improve sleep quality. LONG-LASTING & WASHABLE: Designed for both infants and toddlers (2-stage) and 100% washable at home. PEDIATRICIAN RECOMMENDED: For your babys health, safety, and development. Hypoallergenic. Winner of numerous awards. GREENGUARD GOLD CERTIFIED: Lowest VOCs, contains no foam, latex, springs, glue, or allergens. 100% recyclable. Proudly made in the USA. If you’re feeling the pinch, (And we have a toddler and a newborn so I sympathize!) then the Safety 1st Transitions mattress is a great choice. Costing several times less than the “Little Dreamer” or “Newton” mattresses, it still offers great levels of support for your child. It’s another one that is “Dual Core”, so it’s extra-firm for a newborn and still able to be used during the toddler years. The Safety 1st Transitions is lightweight, well-cushioned and has been awarded the Greenguard Gold Certification. This means it’s been tested and the materials used shown to be safe for your child. Another great point about the Safety 1st product is the cover is non-absorbent. This is perfect in case you spill any milk or your toddler has a “little accident”! Who’s This For? Parents who might not have $100 – $200 for a crib mattress but still looking for a high-standard. Here’s a crib mattress that has quite a unique feature. As the name implies “Sealy Soybean” uses a cushion made from soy bean oils that have been harvested by American farmers. Sealy says this produces a natural, comfortable product that will not sag. They have been in the mattress business for over 160 years. So although it sounds a novel approach, it’s backed by many generations of experience. Another great feature of the Sealy Soybean is the cover and binding are both waterproof. I especially like how you can wipe it down with just a babywipe (is there anything they can’t do?!). Once again, the Sealy is certified as Gold by Greenguard, ensuring the construction is safe for your child to use. It’s also been the proud winner of the “Best for Baby choice” at the 2013 and 2014 Woman’s Choice Award. If it’s good enough for thousands of mothers to vote for it, then we believe it’s a great choice for your and your newborn. Who’s This For? Green consumers will love Sealy’s environmentally-friendly mattress and your baby should too! SAFETY & QUALITY TESTED -- Firmness, durability and crib fit tested, passes American Society for Testing and Materials Crib Mattress Standards; this entire crib mattress is GREENGUARD Gold certified for indoor air quality and tested for chemicals to help create a healthier sleeping environment for your baby. All of Our mattresses are tested for flame retardant chemicals and we do not add flame retardant chemicals. MADE IN THE USA -- Sealy crib mattresses are proudly made in the USA; more babies sleep on a Sealy than any other crib mattress brand in the USA. This mattress offers a Lifetime warranty on workmanship and materials. We wanted to include this one in our round-up because for the price, we couldn’t find anything that offers a true hypoallergenic core to keep your baby safe! Not only that, but we found the core to be very supportive. Not surprising, considering that it’s been made of foams that have been thermo-bonded for strength. We’ve seen hundreds of parent reports, all saying their Heavenly dreams mattress has stood the test of time, being handed down to more than one child in the family. For the price, we believe this is pretty amazing. The only concerns we have with this product is it’s not as “Green” as others on the list. It doesn’t tick all the natural, recycled boxes that for some parents might be high on their list of priorities. However, if you’re on a budget and need a hypoallergenic mattress right now, this is one of the leading ones on the market. Who’s This For? Parents on a tight budget and need a well-made mattress that will go the distance.